Yup.............zaharie ahmad shah the pilot ditched the plane. 2. Hijacking, and plane is still intact somewhere (or crashed during struggle in cockpit). 3. Bomb explodes and plane disintegrates. The fact that the Malaysian military is now saying they tracked this airliner WEST, for another hour after its transponder disappeared, leads me to believe either the pilot or co-pilot intentionally sabotaged the plane. However, it could also indicate a hijacking. The whole thing is just hard to believe. The Iranians traveling with stolen passports certainly lend credence to the hijacking possibility. The U. S. has been searching the Strait of Malacca since Day 1, so to me it would seem people behind the scenes know more than they're letting on. I’m not often right, but, dayum, I nailed this one. Yup, The pilot was about to commit suicide as it was getting hijacked but a bomb went off so the plane disintegrated. Good call! A Boeing 737 carrying 188 passengers and crew crashed into the sea shortly after taking off from Indonesia's capital Jakarta. Lion Air flight JT-610 crashed near Indonesia shortly after take-off, bound for Pangkal Pinang. 188 people were on board the plane when it crashed north and a search is on for survivors. Pictures from the scene showed plane debris and oil floating in the water hours after the aircraft came down. The lady who cut my hair today is from there. The pilot had requested to turn around just before flight JT-610 crashed into the ocean. It's not known yet why. Six bodies and lots of debris have been recovered thus far and a full-scale investigation is underway. The Boeing 737 was brand new, the scheduled flight was only 1-hour, the weather was good, and the crew was said to be experienced. Very sad day for the loved ones of the 188 people on board. Completely debilitating to pilots, and a 100% deathknell. Anyway, that’s my very uninformed guess. (10-29-2018, 02:25 PM)Midwest Spy Wrote: Smoke in the cabin/cockpit. Could be. An aviation expert said today that he's considering a bomb a possibility, given what he knows now. Murder/suicide was also tossed out there. The plane went off the flight path before dropping rapidly into the ocean. On board were 178 adults, one child, two babies, two pilots and five flight attendants. There were also 20 staff from the Indonesian Ministry for Finance on board, and 23 government officials on board. It's the first time this Boeing model has crashed. I hope the black box is located soon so aviation investigators have more to go on. The plane involved in the JT-610 crash was a new aircraft. The Boeing 737 Max 8 had flown only 800 miles before the crash, according to the National Transportation Safety Committee. The 737 Max 8 is designed to hold up to 210 passengers, according to Boeing. So, it was well below full capacity. It's not yet clear what caused the crash, but Lion Air president Edward Sirait confirmed the plane experienced a technical issue on a previous flight. A passenger on the same flight a day earlier said the plane had been delayed for technical issues and she heard a lot of noise during the flight. It's also been reported that the previous issue was related to speed control. The pilot of the crashed plane the next day had requested to turn around just after take off for some reason. Shortly thereafter, the plane sped up drastically before losing altitude and going off the radar. The relatives of the passengers are providing authorities with DNA so that remains can be positively identified. What a heart-breaking experience that must be. 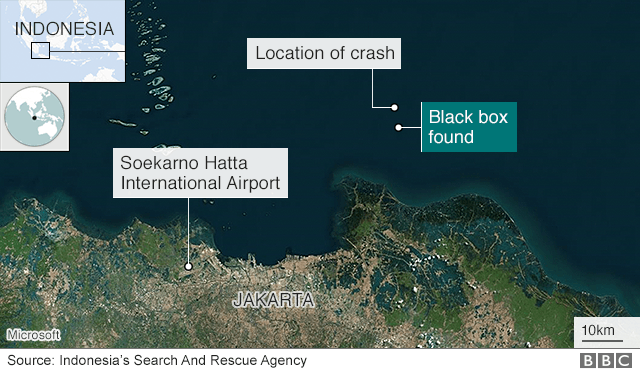 Search and rescue divers in Indonesia located a black box today from flight JT-610. It's not clear yet if it's the cockpit voice recorder or the flight's data recorder. Aviation officials have confirmed that the technical difficulties experienced on the same plane/flight one day earlier were related to speed control, per the flight logs. Indonesian authorities are working with Boeing in their investigation. If this really is the case of a faulty pitot tube (instrument to measure airspeed), and it’s failure is determined to have brought this plane down, then we have a real problem. I know that most of today’s pilots rely heavily on autopilot. If the airspeed is incorrect, autopilot will not be able to overcome the issue, and the plane will crash. How can well-trained pilots not realize that there’s a problem with airspeed (ie, stall is occurring)? Switch off the damn autopilot and fly the airplane manually. I know Air France 447 over the Atlantic suffered the same fate. Faulty pitot tube, bad airspeed readings, and essentially flew the plane into the ocean. An experienced pilot should be able to overcome incorrect airspeed readings on ‘feel’ alone. Certainly enough to turn a plane around and get it back to the airport without stalling out and crashing. Well if the pilot requested to turn around then he obviously knew there was a problem, right? You'd think he would switch to manual and land it if he could. Or are pilots morons now who don't know anything more about flying a plane than me? It might have been an acceleration issue related to programming that was not in the pilot's control but instead imbedded in the plane's system, if I understand correctly. That's what the technician said about my brand new dishwasher that hasn't worked since the day I got it. I feel more comfortable going on an old plane that still has the ashtrays on the arms of the chairs. They don't make stuff like they used to. Boeings are easier to fly by feel Airbus not so much. I'm not convinced that the crash was due to the plane itself, given that I haven't seen reports of any other airline having problems with the Boeing 737 8 MAX. All previously mentioned alternatives are still on the table. I'm also wondering if maybe the technicians who repaired the plane the day before might not have had enough familiarity with the new system and exacerbated the speed control problem. So far, the evidence appears to be pointing towards a software malfunction and insufficient pilot training causing the crash of flight JT-610. Only moments after taking off from Jakarta, the pilots flying Lion Air 610 realized they were losing control of their 737 Max jetliner, the newest, most fuel-efficient and most automated model of Boeing’s mainstay aircraft. The jetliner unexpectedly pointed its nose down, sending it into a series of 26 dives at less than 5,000 feet. The pilot pulled back on the control yoke with all his might to bring the nose up, but the plane entered a death dive into the Java Sea. The crash, 11 minutes after takeoff, killed 181 passengers and eight crew members. The investigators from Indonesia, Boeing and the U.S. National Transportation Safety Board are examining the role played by software intended to protect against pilot errors that have caused several deadly crashes around the world and whether the crew understood that system. When the aircraft’s flight control system malfunctioned, the pilots had no clue that flipping a single switch in the cockpit would counteract the problem. Damn, i'm flying to cabo on thursday. Well, wear your seatbelt tight at all times and really pay attention to the emergency evacuation instructions this time! Seriously, have fun Biggie. I miss Cabo. If you're taking Alaska Airlines out of LAX like we always did, they fly AirBus not Boeing (and the pilots are likely required to undergo more training/testing than in Indonesia, I imagine). (12-10-2018, 11:53 AM)BigMark Wrote: Damn, i'm flying to cabo on thursday. Sonofabitch! I haven't had a vacation since 2008. What am I killing myself for. Ugh. *sigh* Have fun, honey, make lots of lovely memories. Be careful and don't make eye contact.